The principle of electron probe X-ray microanalyzer (EPMA) is that a focused accelerating electron beam interacts with at an interesting point on the surface of a relatively flat sample in a micro-volume, generating the X-ray spectrum and providing qualitative and quantitative elemental microanalysis. The energy of incident beams is typical from 5 to 30 keV. 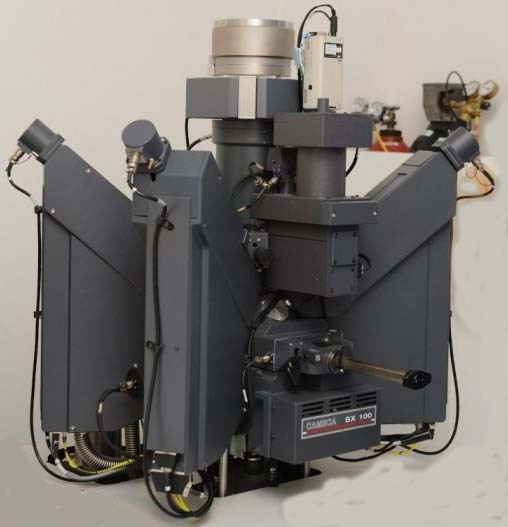 EPMAs can normally be computer-controlled and equipped with both Energy Dispersive (EDS or called EDX) and Wavelength Dispersive X-Ray Spectrometers (WDS) as well as both Scanning Electron Microscope (SEM) and Backscattered Electron Imaging (BSE) as shown in Figure 4609. For instance, some EDS/WDS combined system can simultaneously analyze up to 13 or more elements (e.g. 5 WDSs and 8 EDSs). The book author (Dr. Liao) welcomes your comments, suggestions, and corrections, please click here for submission. You can click How to Cite This Book to cite this book. If you let Dr. Liao know once you have cited this book, the brief information of your publication will appear on the “Times Cited” page.